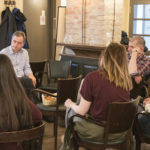 According to Dr Adrienne CSIZMADY a small Science Café took place in Budapest (Hungary) with a lively discussion connected to a film (In Transition – Transition towns ) that was shown at the meeting. 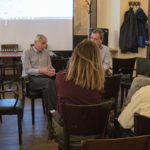 After it the participants had a debate with the coordination of Zoltán Ferencz and László Antal Z. (http://www.klimabarat.hu) about Environmental Citizenship and transition movement. Transition is a movement that has been growing since 2005. It is about communities stepping up to address the big challenges they face by starting local. By coming together, they are able to crowd-source solutions. They seek to nurture a caring culture, one focused on supporting each other, both as groups or as wider communities. 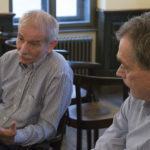 In practice, they are reclaiming the economy, sparking entrepreneurship, reimagining work, reskilling themselves and weaving webs of connection and support. It’s an approach that has spread now to over 50 countries, in thousands of groups: in towns, villages, cities, Universities, schools. One of the key ways it spreads is through telling inspiring stories, and that’s what we aim to do on this website. We really hope you feel inspired to take part, we’d be honoured if you did. The main aim and objective of the Action is to ENEC (European Network for Environmental Citizenship through Formal and Non-Formal Education) Action aims to enable scientific developments in the field of Environmental Citizenship leading to new conceptualizations and new products and thereby contributing to strengthening European research and innovation capacities in the field. © ENEC - 2018. All rights reserved.